With over half a million birds, the sandhill crane is the most plentiful crane alive today. The Florida subspecies (Grus canadensis pratensis) numbers only 5,000, and like the Mississippi and Cuban subspecies, is considered endangered. Interestingly, these are the three subspecies that do not migrate. 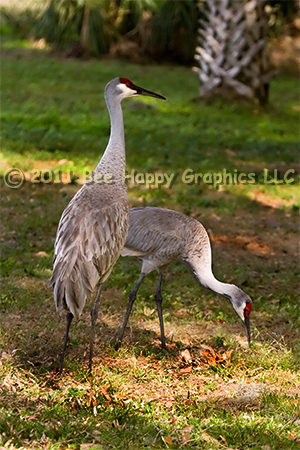 It takes two and a half years for sandhill cranes to reach their adult plumage. Juveniles do not have the red crown and their neck is more tawny (brown). Photographic details: Canon EOS 30D camera w/ EF 100-400mm f/4.5-5.6L IS USM lens set at 170mm. Flash was not used. Camera was set for 1/1600 sec on shutter priority with no exposure compensation, resulting in an aperture of f/5 at ISO 500. Fine Art Paper 15" x 11" 26" x 21"
Canvas N/A 35" x 28"